One of the most interesting topics I have worked on in recent years has been that of attitudes towards immigration. 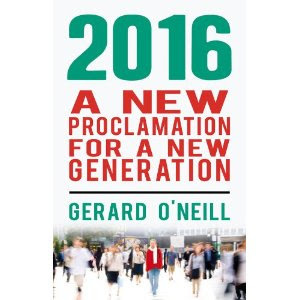 It is obviously hugely important to Ireland given the unprecedented speed and scale of our own immigration experience. But we do have the advantage of learning from the experiences of others, if only to avoid the worst mistakes. And God knows Europe has made plenty of mistakes that we can learn from - if we want to. so far, Ireland has been spared the worst of anti-Muslim and anti-Jewish bigotry, mainly - I suspect - because we don't have large populations of either group. It is different in other countries of course, and a recent study by the Pew Research Center paints an extraordinary, even alarming picture of the scale of anti-Muslim and anti-Jewish prejudice in parts of Europe. 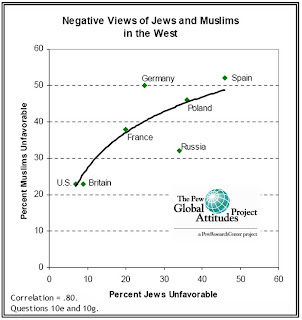 The chart shows the percentages of populations in different countries who are intolerant towards Jews, mapped against the percentage intolerant towards Muslims. In fairness, prejudiced people appear to be equal opportunity bigots: being intolerant towards both Jews and Muslims at the same time (the correlation is 0.8!). The exceptions are Germany (more prejudiced against Muslims than Jews), and Russia (more prejudiced against Jews than Muslims). We have prejudiced people in Ireland too of course. The recent ESRI report on experiences of discrimination among ethnic minorities in Ireland points to particular problems for Africans in particular and black people in general. Though much of the information is woefully dated (from 2004 for some statistics), the findings are not surprising. Racism is a cultural virus (or meme as Richard Dawkins calls it) is probably impossible to eradicate. But challenging naked prejudice and discrimination is one way of at least minimising the extent to which it can spread. That said, I don't think worthy calls from The Equality Authority and the likes will make much difference. An extraordinary article in The Irish Times by Gerard McMahon from DIT recently captured for me the Kafkaesque futility of so much activity by that organisation. The article describes various cases before the Labour Court and the Equality Tribunal, one of which ruled that an employee could not be fired for theft if that person happened not to speak English as a first language and was not told in writing in their own language that stealing from your employer was not permissible. ... it looks like employers will have to change all of their documentation into however many languages are necessary to facilitate foreign nationals in their workforce. And that's assuming people can read. Alternately, they might be well advised to shell out on English language classes. Do you think? Well, speaking on behalf of those of us living on Planet Reality with payrolls to meet at the end of each month, somehow I don't think this so. In fact, the reverse is going to happen - by making it more expensive to employ people from different ethnic backgrounds, employers will simply not hire them. You can call that discrimination, but I call it: SELF-FULFILLING PROPHECY. So let's learn what we can to avoid the legacy of past prejudice still evident in Europe, but let's also avoid spectacular home grown mistakes that serve more to confirm the anti-business prejudices of unelected quangos than any underlying prejudice on the part of the Irish people. How do you empirically discriminate between a "prejudice" and a Bayesian prior?